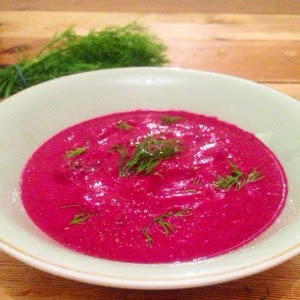 Ideal for a hot summer days, yet comforting enough for an autumnal evening, chilled beetroot soup is one of my favourite treats. I made the above with beetroot I grew from seed on the allotment. If you're cooking the beetroot yourself, simply simmer them whole in a pan of hot water for around 2 hours - make sure you don't cut into them before boiling as they'll loose their vivid colour. Once cooked allow them to cool in the water, then place them in a blender along with dill, sea salt, fresh chicken stock and sour cream - measurements to taste. The more cream you add, the more pink the soup will turn. Blend until smooth, serve and garnish with a spring of dill and black pepper. Chill again if necessary.